Upper division undergraduate and graduate students as well as professionals in economics and finance. Courses include econometrics, applied economic analysis, economic statistics, and probability and statistics. Ramazan Gençay is a professor in the economics department at Simon Fraser University. His areas of specialization are financial econometrics, nonlinear time series, nonparametric econometrics, and chaotic dynamics. His publications appear in finance, economics, statistics and physics journals. His work has appeared in the Journal of the American Statistical Association, Journal of Econometrics, and Physics Letters A.
Faruk Selçuk is a faculty member in the department of economics at Bilkent University, Ankara, Turkey. His research interests are time series analysis, financial econometrics, risk management, emerging market economies, and the Turkish economy. His recent publications appeared in Studies in Nonlinear Dynamics and Econometrics, International Journal of Forecasting, and Physica A. He is a consultant for Reuters-Istanbul and Reuters-Moscow. Brandon Whitcher is currently a visiting scientist in the Geophysical Statistics Project at the National Center for Atmospheric Research. He was a research scientist at EURANDOM, a European research institute for the study of stochastic phenomena, after receiving his Ph.D. in statistics from the University of Washington. His research interests include wavelet methodology, time series analysis, computational statistics, and applications in the physical sciences, finance, and economics. His publications have appeared in Exploration Geophysics, Journal of Computational and Graphical Statistics, Journal of Geophysical Research, Journal of Statistical Computation and Simulation, and Physica A. 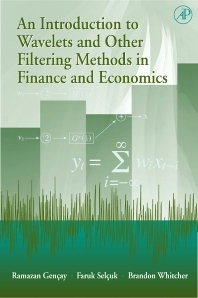 "The authors have provided a very comprehensive account of the filtering literature, including wavelets, a tool not widely used in economics and finance. The volume includes many numerical illustrations, and should be accessible to a wide range of researchers." --PETER M. ROBINSON, Tooke Professor of Economic Science and Statistics and Leverhulme Research Professor, London School of Economics, U.K.